Whole to part to whole. I took a class to learn how to teach music to children in my college days. One of the strong concepts that came out of that class was Whole to Part to Whole: introduce the whole song, focus on a part, then focus on the whole once again. When I introduced the January song of the month, I wanted the children to hear the whole song, yet be engaged at the same time. Bingo! The activity Silent Video was just the thing. Thank you! 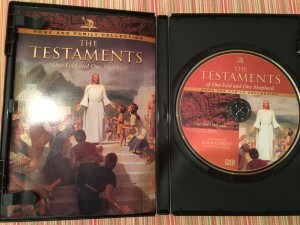 I don’t have the Testiments DVD, but I do have the Book Of Mormon Stories DVD. I decided to try that out with the song and found that the song works perfectly with chapter section 44 “Jesus Christ Blesses the Children. It’s only long enough to sing the first verse, but it is crazy how well it goes with the song! It’s starts off with children gathered ’round Jesus just like the song says! And when I get to the part that says, “I did not touch him or sit on his knee”, it changes to a picture of a child sitting on the Saviours knee! Ha. It even has a picture of the Savior with a tear on His cheek almost directly after I sing that part. So I think I will give this a go on Sunday! When they learn the feeling behind the songs like you gave them today, they sing with their hearts and souls. Thank you for giving them your testimony today in a wonderful way.